Dental patients are becoming increasingly concerned with having metal titanium implants placed in their mouth because of the impact it may have on their overall health. As a biological dentist, Dr. Andow believes it is always ideal to use the least reactive and least toxic materials possible. Metal-free Zirconia dental implants are increasing in popularity for these reasons. 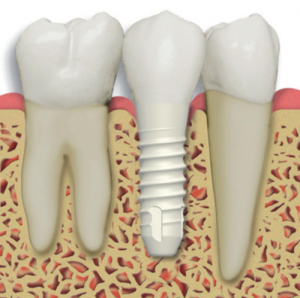 These implants are known to interact well with the bone and gums, and they are a good holistic option if you want an implant that will support your overall health. Zirconia implants are an alternative to the traditional titanium implants. They were released in 1987 and are gaining popularity as a holistic alternative to the metal titanium implants. Zirconia implants are a non-metal, ceramic material that is white in color and has all the same advantages as traditional titanium implants. Biocompatibility - Zirconia is a biocompatible material. The firm bond that establishes itself between the bone and ceramic implant is believed to be bio-inert. This means your body doesn't react with an inflammatory response as it would with a foreign body. In contrast, research shows titanium-based implants generate metallic debris. This debris can cause inflammation in susceptible patients and can prompt an autoimmune reaction. Reactions are more likely to occur in individuals who are genetically predisposed. Additionally, an increasing number of individuals with titanium implants present with allergies, sensitivities and other skin reactions. Maintenance and Home Care - Regardless of the type of implant you select, much attention should be given to keeping the gum tissue around it clean. Like teeth, implants can fail if bacteria accumulate along the gumline. Research indicates the lack of electric conductivity in ceramic implants makes it harder for bacteria to stick on the implant. This makes it easier to maintain healthy tissue with proper cleaning technique. Aesthetics - Zirconia is a white ceramic material and not grey like titanium implants. This provides a more natural look and appearance. This may not seem like a big deal, however, if you have thin gums, the grey cast of titanium may make your gums look grey or black. Zirconia implants, on the other hand, retain a natural look with no grey shadow or show through. Durability - Zirconia implants are extremely strong and durable. Long-term success is one of their most attractive features. These dental implants are designed to withstand great force and they are known for their superior strength and inflexibility when put under pressure. Meridian Flow - Because they are biologically inert, Zirconia implants may offer the best option for maintaining meridian flow from tooth to organ and from organ to tooth. This is especially important to those who employ the principles of acupuncture and pay particular attention to their body's meridian flow and blockage. Not familiar with this concept? Learn more about it here.